Named for its downward facing bulbs and inspired by the current TV series "Stranger Things", this is a simple and yet stylish vintage lamp. While basic in design, this simple retro-style lamp is the perfect accent to a desk, end-table, or mantle. The included 40 watt bulbs are not as bright as bulbs you may typically use in your home, but allows for direct viewing and appreciation of the old-style filament wiring pattern of the Edison bulb. While it definitly provides a soft, warm illumination, in many respects this small lamp focuses on style and atmosphere, rather lighting a room! 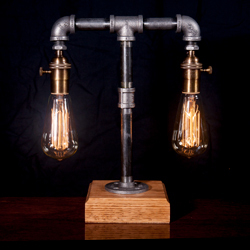 Like our other lamps, this product is hand constructed and build to order, so expect a 2-3 day delay before shipping. We focus on quality in all aspects of the construction and offer an unconditional one-year warranty on the lamp. Please note that all of our lamps are designed strictly for indoor use.